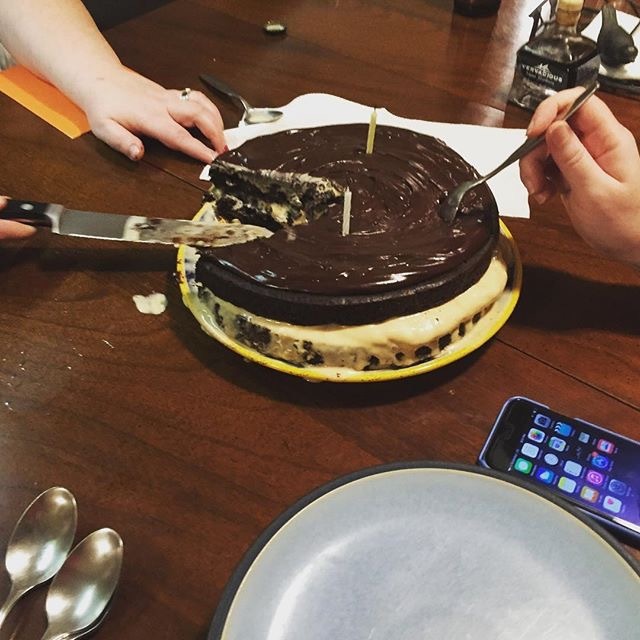 The gelato cake, as discussed in the podcast, while it was still sort of holding together. Here it is! The first episode of the Eight Piece Box podcast! You can listen in the player below or subscribe to the podcast in iTunes! We wanted to create some continuity between EPB and What’s Cookin’ Now!, so we decided to get the core WCN! crew of Tamara Sapp, Les Roll, and Jenny Williams into the studio for a long-winded chat. In the first segment we talk about What We’ve Been Cooking/Eating/Drinking, with discussions of meatloaf, Appalachian dolmas, the joys of melted ice cream, and the emerging New Orleans tiki bar scene. In the second segment we talk about agriculture as economic development, as Jenny reports from the Southern Sustainable Agriculture Working Group conference. And finally, we talk about our Food Year’s Resolutions–the things we want to do differently in 2016. Previous Article Introducing Eight Piece Box: The Podcast!